I title this “Our” students because these children are as much a part of your life as they are mine. We all make up Nazareth House and through that love and generosity, many students are receiving an education—a hope for a brighter future. Last week I asked James Mansaray (our Nazareth House Director in Sierra Leone) to take pictures of children around Freetown (see previous post below)in their school uniforms so that I could show these traditional outfits to all of you. As the photos that he took arrived into my email inbox, one by one each child captured my heart. I had planned to examine the uniforms to compare them with our design sketches, however, instead I found myself focused on each child’s beautiful face. All of the children are adorable, but one face; one precious smile in particular, seized my undivided attention. 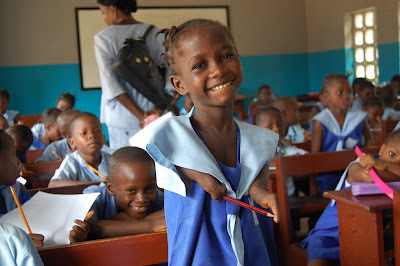 It was that of little Josephine Sankoh (pictured to the right), a victim of the RUF—having been attacked with a machete during the war (while only an infant), she flashes the most genuine smile at James as he snaps her image. I am ashamed that I complained my coffee was at proper temperature this morning...sigh. This is the case of most children in Sierra Leone, they have nothing but are always happy—abundantly grateful for the least bit of attention or the smallest gift. 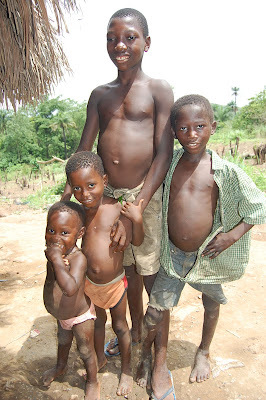 Our students in Kabala are lacking in clothing. What better way of helping them as we provide them a school building (education in a sheltered structure safe from the weather) but to also provide them with apparel. To promote discipline and enhance the education experience, it is the tradition for the relevant schools in Sierra Leone to dress their children in uniforms - so that all are the same. As the construction of the building nears completion, it is time to begin making our student’s uniforms. The material will be purchased in either Makeni or Freetown where it is cheaper. Tailors/ Seamstresses in Kabala are ready with their sewing machines to whip up each child’s uniform. This stimulates the local Kabala economy while providing for the need. Nazareth House will cover the cost of labor and material. We are asking for donations of $25 to provide two (2) uniforms per student. Most of our students wear little more than shredded rags to cover their body, the two uniforms will be alternated to wear throughout the school week. Your gift of $25 delivers two uniforms to a student (boy or girl). Once received, a photo of the child dressed in your uniform gift will be sent to you along with the child’s name and age. 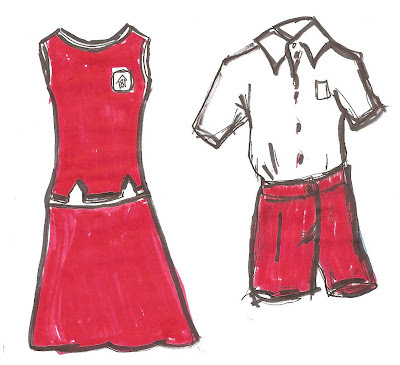 We are considering the color of red for our NHA School Uniforms. (see sketch above) However, a final decision has not been made as we are also considering using the colors in the National Flag. All uniforms will have the NHA Logo on them. The girls wearing jumpers and the boys white shirts and shorts. The tailors will make the final decision on design. James has been in Kabala this past weekend to bring funding for the materials to finish the school. We are extremely close to ending the construction and have already begun to make the desks, secure funding for the uniforms and acquire the learning materials. The rainy season is upon us and we must work fast and hard to be in the school quickly. Your donations are vital to this project. We are almost there. Please help! Can you believe it?—you are providing (not only an education) but the building and necessities for these children. What a wonderful offering of love! God bless you.